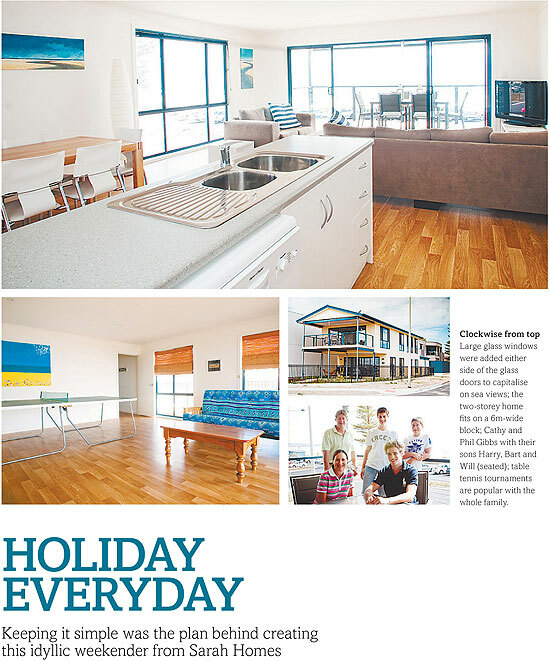 A holiday retreat, just six metres wide that had to cater for a family of five, needed specialised treatment. The Gibbs family found their choices were quite limited. "We looked around at a couple of designs but there wasn't a huge range," Phil says. "But once we found this design from Sarah Homes it was perfect for what we wanted and needed. "We always liked the ideal for having a family home. We had one at Carrickalinga but we found it hard to find the time to get there. My wife Cathy and I run a business that is open seven days a week and, with three children, there is often sport on weekends or other commitments. So we decided to look for something much closer to us. In the end we found a block at Moana, which was ideal because it is just over a 30-minute drive for us, using the expressway. Now if feels worthwhile making the trip, even if it's just for a Friday night and we have to go back for Saturday morning sport." Faced with building on an extremely narrow block of just over six metres, the family found the ideal design with Sarah Homes. The design has two bedrooms on the ground floor, with a large bathroom and staircase separating them from the large rumpus room. Upstairs houses the main bedroom at one end, with living and entertaining areas covering the remaining space. The main bedroom has a spacious walk in wardrobe and an adjacent bathroom, with corner shower, is close enough to double as an ensuite. The galley kitchen includes an island bench with double sink, dishwasher and underbench storage. Behind is a stainless steel oven with electric cooktop, while a large walk-in pantry is located at one end. "We had to make some changes to the design as the council wouldn't allow us to have parking for three cars at the front of the home," Phil says. "So we extended the rumpus room by three metres and paved the remaining area for an outdoor space. "The extra space in the rumpus allowed us to include a table tennis table and it has just become a much more liveable area. On the top level we added large glass windows either side of the sliding glass door, to make the most of the great sea views we have." he says. "We spend a lot of our time sitting on the veranda watching the world go by. There is always something interesting happening."